The PR550 efficiently removes matted thatch from turf in 20" passes, and its rugged design withstands the most demanding use. Because the rotation is down sweep, the flails propel the PR forward, making it self-propelled and reducing fatigue. 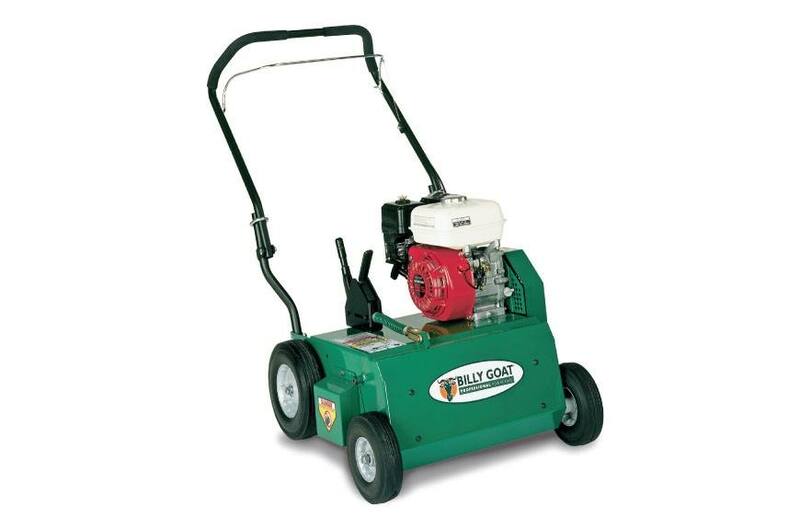 Additionally, because it weighs slightly more than other power rakes on the market, with steel guards, heavier wheels, premium bearings, and a 10-gauge steel engine base, the PR absorbs much of the vibration before it is transferred to the handle, which improves operator comfort and handling. Heavy-Duty Wheels: Steel rim and roller bearings stand up to the most demanding customers and applications. Premium Steel Pulleys, Easy to Adjust Idler & Easy to Change Belt: Contribute to simple service and long life. Protected by a steel guard. PR550 No Thread, No Bolt Foldable Handles: Great for storage, transport and long life. PR550 Infinite Heavy-Duty Depth Adjustment: Save on blade wear when compared to preset adjustments that may promote premature flail wear. PR Flail Reel: Standard on PR. Heat treated and tempered blades stand up to heavy use. PN 350112.